Charmaine's Pastry Blog: True or false? Depending on how traditional you are, the great debate on whether to have a real wedding cake versus a fake (a.k.a. display) wedding cake can sometimes be intense. These styrofoam-filled look-alikes are often misunderstood, treated as second class citizens of the cake world, labeled tacky or ostentatious. 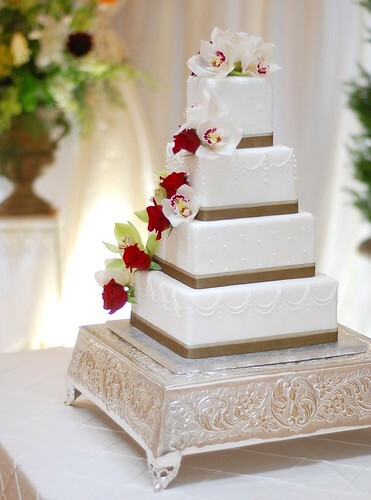 Personally, I love display cakes, having one for our wedding years ago before I was even in the pastry world. Perhaps I am biased now because of the advantages a display cake offers to me as a pastry professional. A display cake is so easy to work with because it is lightweight and easy to transport, and without the need for refrigeration, it allows flexibility with timing when decorating. This is a huge bonus for me, my small kitchen, and work schedule. 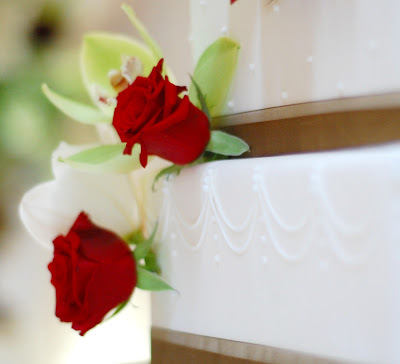 None of the guests would know the cake is fake anyways because a small section of real cake is hidden and incorporated into the back of the cake into which the bride and groom can cut and eat during their cutting ceremony. The actual cake served to the guests can be made in slab form and does not need to be cakey and dense like a real tiered wedding cake must be for structural integrity. Flavours and textures can be diverse and customized. A slab cake can be pre-cut into neat and tidy pieces which are easily served in a timely fashion. For those brides and grooms who like the look of rolled fondant but can not imagine eating it, having a display cake with a real slab is the best of both worlds. Luckily, Daniela and Marino are in favour of display cakes too and trusted me with the creation of their beautiful four-tiered square wedding cake this past weekend. Royal icing piping details gave the cake a simple elegance and the lovely double olive ribbon effect with sheer over satin was unintentional but highly successful. It was truly a joy to create. Congratulations Daniela and Marino! 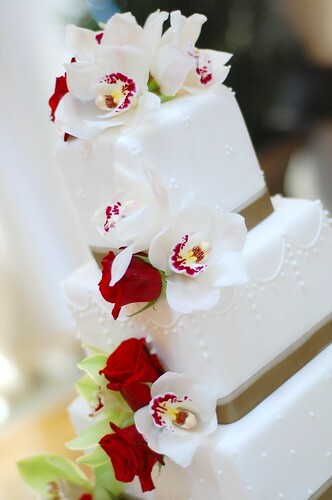 Posted by Charmaine at 12:41 p.m.
Beautiful cake, even if it's display! I think display cakes are fine - NO ONE is going to know any different (other than the key people, of course). And all of the points you brought up are completely valid - I would totally go for a display cake then sheet cake in the kitchen. October 7, 2009 at 10:37 p.m. I immediately thought I was in the "no" camp, but after your description realize I'm all for that! October 8, 2009 at 11:52 a.m. The cake is very nice. I never thought it's a display cake. December 10, 2009 at 5:08 a.m.